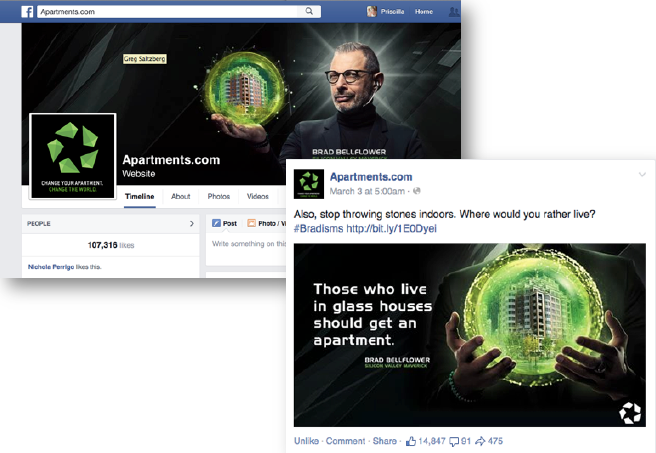 How we helped Apartments.com write the advertising playbook for the online listings industry. You’d think that the Internet would have solved the time-consuming and often painful process of finding an apartment to rent. But, instead, it’s only complicated it. Finding a place to rent often means an endless round of Google searches through a patchwork of dubious websites, real-estate listing sites like Zillow, and mom-and-pop regional services, along with what some would argue is the shadiest place on the Internet: Craigslist. For the average renter, the process was complex and full of pain points at every step. Into this Wild West of home-rental search services, a leader in real estate data called CoStar entered the fray. Seeing an opportunity in the market for a truly elevated home-rental search experience, CoStar acquired Apartments.com with the aim of making it the go-to, nationwide site for online home-rental searches. It was a goal that would require much more than a website overhaul. It needed to stand out in a confusing and muddied field of faceless competitors. It wasn’t enough to just be found on Google; Apartments.com wanted to become a sought-after destination for those in search of a rental home. This meant we first had to rebrand Apartments.com and give them a whole new identity. Then, we needed to build the business by discovering unique digital solutions that would actively drive renters to the website. We knew that, of the nearly 25 million Americans who rented each year, the average renter made a move every 18 months, usually precipitated by a life change such as a new job, a move to a new city, an engagement or marriage, or a new baby. These people, whom we coined “Fresh Starts,” became our target audience. They needed a new apartment that matched the transformation that was occurring in their lives. While Fresh Starts were excited to find a living situation that reflected their changing reality, the process itself was excruciating and fraught with anxiety: bogus listings, poor methods of contact, lots of aimless driving around, and missed appointments for showings. It was our job to show them that Apartments.com had a better way — that they could have an ally in the process. We wanted to demonstrate that using a modern, national, feature-laden site with an enormous inventory of apartments for rent could immediately transform their searches, and their lives. We launched with high-impact and mass-reach traditional placements, including prime-time premieres and finales, late-night TV, radio, building wraps, and mass transit. Meanwhile, digital executions included large home-page takeovers on sites like Yahoo! and YouTube. Social executions were featured on Facebook and Twitter, and we embraced high-engagement formats featuring custom social content on sites like Buzzfeed and Gawker. Along with our big launch, we implemented a data management platform to capture attributes in real time of people who saw, engaged with, or clicked on our ads and converted to Apartments.com. We then used these attributes to identify target audiences and optimize media and messages specific to them, ultimately driving traffic to the site more effectively. Since the launch, Apartments.com revenue has tripled, and bookings have increased by 62%. Brad has evolved as well. Once a tech guru, he has become a visionary personality, tapping into the emotions around the life change of finding a new home, and on a mission to improve renters’ lives. The success of Apartments.com has allowed CoStar to start focusing on local markets like Los Angeles by acquiring sites such as Westside Rentals, giving people access to more free listings than ever before. They’ve also opened 30 new offices in the past year and, since the launch, the number of leads has increased 210% on a quarterly basis. Before the campaign, Apartments.com had 5 million unique visitors; as of January 2017, that number has more than quadrupled. With no end in sight, it’s clear Apartments.com hasn’t just outdone their competition; they’ve changed the game in true tech visionary fashion.